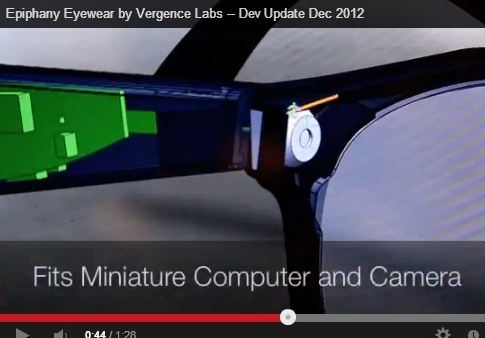 Vergence has made a set of “smart glasses” that are simply well-designed glasses with a computer inside. That computer powers a high-definition video camera that you can use to take pictures or record videos. And it has software and apps that let you integrate with mobile devices to share your imagery with your friends. You can livestream your video directly to your Facebook wall if you wish. Vergence was formed in December 2011, but the team has been working on the project since May 2011, and it has completed it with a staff of just seven. Vergence is also announcing today its own application programming interface for writing apps for its glasses. The features include two mobile apps that connect, stream, view, and share point-of-view video from the glasses. The product uses a scalable video architecture that lets wearers share the videos to social networks or the video servers at YouGen.Tv. You can connect the glasses to any connected device, such as a smartphone or tablet, to upload video or images to the web site. The optics support prescription lenses. The device can record video, transcode it, store it, and stream it. The team of seven includes Miller and Rodriguez. Its staff also includes engineer Peter Brook, designer David Meisenholder (who designed Lady Gaga’s GL20 video glasses), user interface designer Stephen Zito, PR person Vanessa Schott, electrical engineer Joel Brinton, and Eric Smalls, an intern and computer science student who was once homeless. That’s a pretty small team to go up against Google. Investors include well-known venture capitalist Tim Draper, Charlie Cheever, Adam Draper, Joel Yarmon, and other angels. The company has raised a round of $11 million in funding and it is in the process of raising another round. Epiphany Eyewear is selling $299 for 8 gigabytes of flash memory; $399 for 16 gigabytes; and $499 for 32 gigabytes.